This practice is committed to maintaining the privacy of your protected health information (PHI) which includes information about your health condition and the care and treatment you receive from Miami Accident Clinic. The creation of a record detailing the care and services you receive helps this office to provide you with quality health care. This Notice also details your rights regarding your PHI. The privacy of PHI in patient files will be protected when the files are taken to and from the practice by placing the files in a box or briefcase and kept within the custody of a doctor or employee of the Practice authorized to remove the files from the Practices office. It may be necessary to take patient's file to a facility where a patient is confined to or to a patients home where the patient is to be examined and treated. Please review the FCA Privacy Compliance Manual for further review (HIPPA). 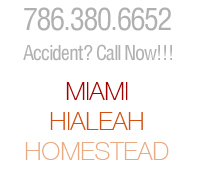 Miami Accident Clinic. All rights reserved.